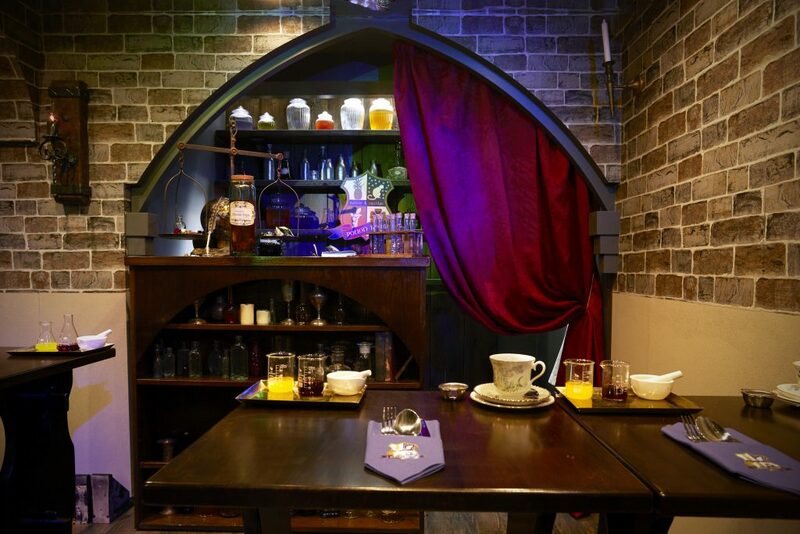 All witches and wizards are welcome at the Cutter & Squidge School of Alchemy in Soho for the Potion Room Afternoon Tea! 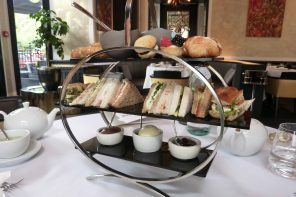 As I mentioned in the Genie’s Cave Afternoon Tea review, the Cutter and Squidge name came about when the sisters, Emily and Annabel Lui, were making their Biskies (a sandwiched dessert with a light buttercream between two cookie-cakes). They got a rhythm into their baking with one being the ‘cutter’ and the other doing the ‘squidge’ to complete the Biskies. I had wondered what other plans they could come up with for the basement of their lovely bakery on Brewer Street. 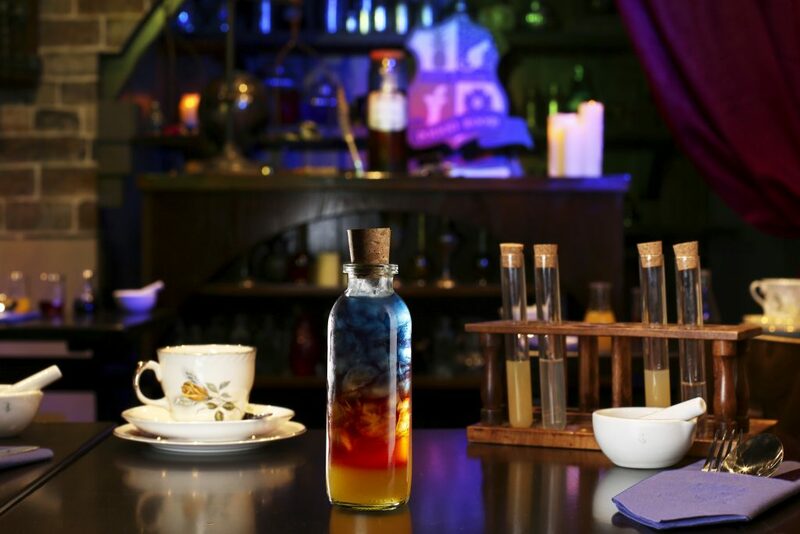 But their imagination has impressed me again as they have transformed the space into a wizarding Potion schoolroom. 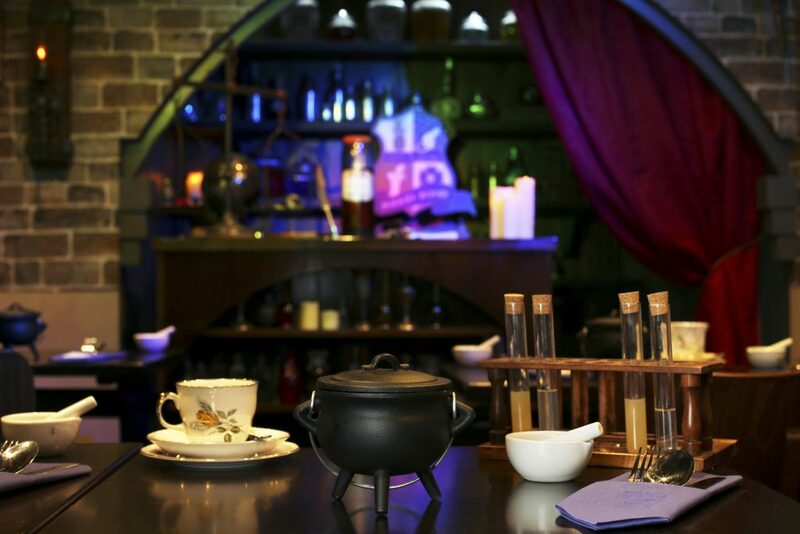 This time, it’s not just a creative afternoon tea on offer but a potion class too in an immersive theatrical experience. 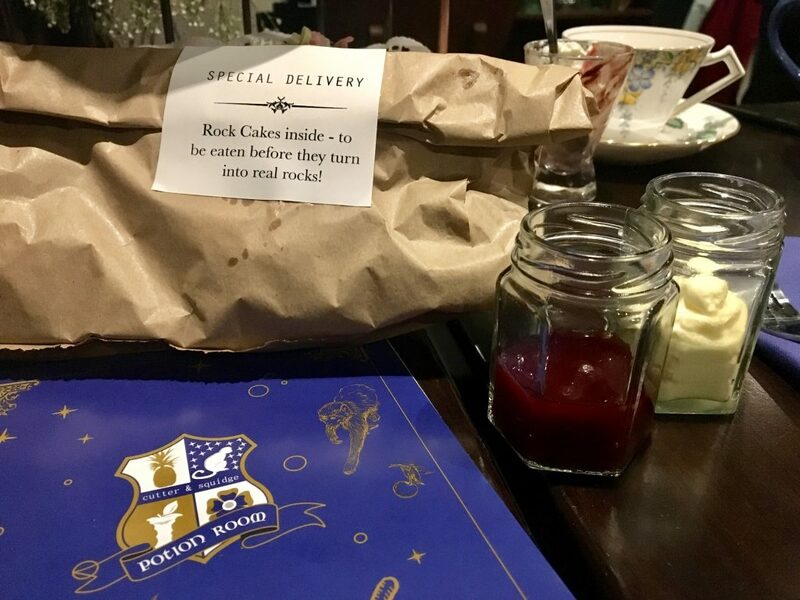 New students (that’s us) get to wear a wizard’s cloak and take a seat at a school desk to concoct edible and drinkable potions, while also enjoying a specially created all-natural afternoon tea. 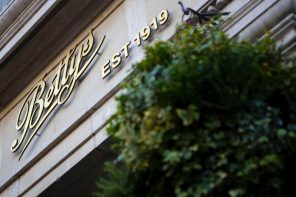 Cutter & Squidge use no additives or synthetic flavourings and everything is made from scratch in their London kitchen. I took my 11 year old daughter who had declared the Cutter & Squidge Genie’s Cave afternoon tea as the best she had ever had. And as my daughter, she’s had many afternoon teas! 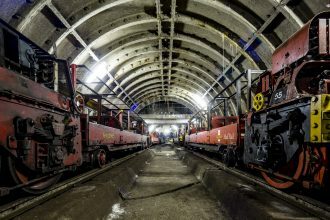 You must book online in advance and allow up to 2.5 hours. There are three sittings a day at 12pm midday, 3pm and 5pm. Do arrive about 10 minutes before as everyone in your class needs to enter together. On the ground floor, Cutter & Squidge looks like a cake shop but it’s downstairs where the magic happens. Once issued with our seat number (this helps if you have pre-ordered a special diet such as vegetarian, vegan, dairy-free or gluten-free) you are led down to the lower level. Leave the cauldron and witches brooms alone (see above) and instead hang up your coat and put on your black wizarding school gown. 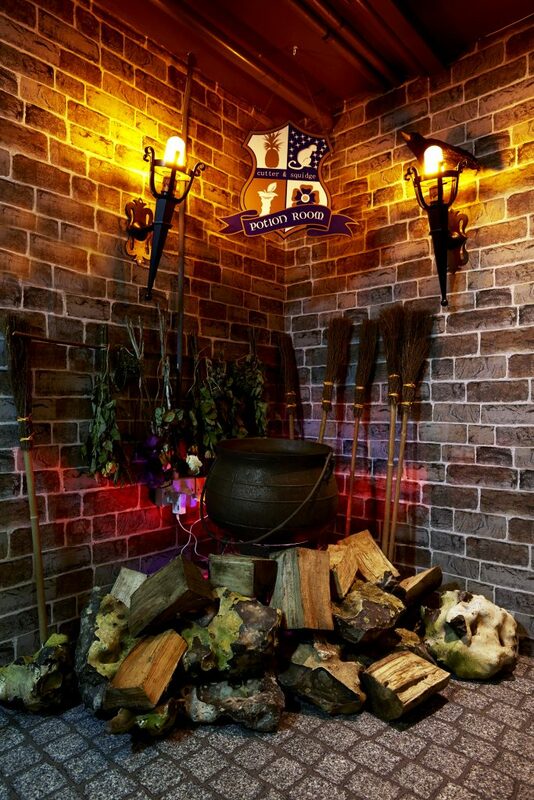 Once all are ready, a member of staff knocks on the classroom door and the Potions Tutor allows you to enter. There’s (faux) brick walls and a teacher’s desk at the front of the room. Shelves are full of school chemistry lesson paraphernalia and academic books. Do look at the stargazing map on the ceiling which has constellations spelling the bakery’s name. Everyone has an individual wooden ‘desk’ and wooden chair which were set in pairs, facing the teacher, when I visited. I wondered how this might work if you were a group of 3, 4, 5, etc. When dining you remain at your desks but you could be put in a line with more desks, I suspect. On your table there is test tubes and chemistry beakers, a pestle and mortar, a cauldron (yes, a relatively small one but a cauldron nonetheless), your teacup, saucer and tea strainer plus a side plate and cutlery. Our teacup, saucer, plate and teapot were all a lovely mismatched vintage combination. 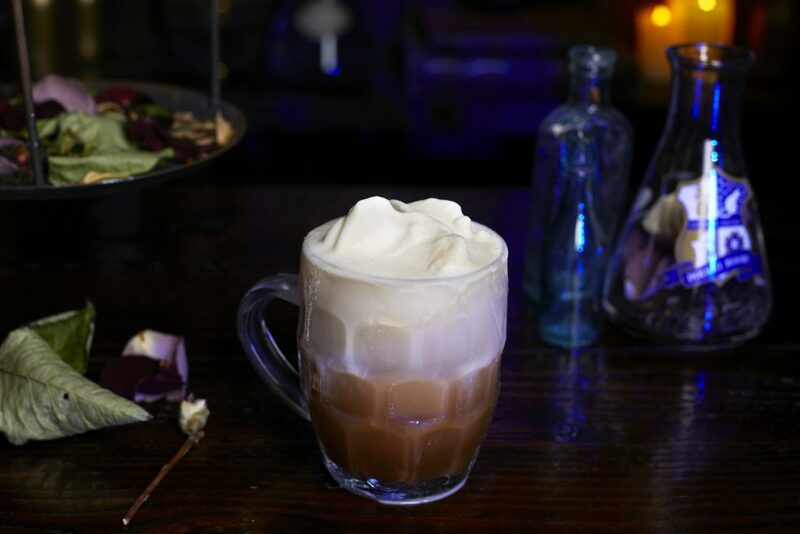 The Potions Tutor gives a short welcome speech to get you into the change of reality – you have joined a secret wizarding school – and then it’s time for the first task. Don’t worry, while this is ‘school’ no-one gets in trouble or turned into a frog if they don’t join in. You are instructed to take the paper from your menu folder and use your pencil to then note your name, table number and your choice of tea. The loose leaf teas include a couple of limited editions: Unicorn Tear Tea and Elixir of Life Tea. I’m not sure what flavours this will offer but you can ask. 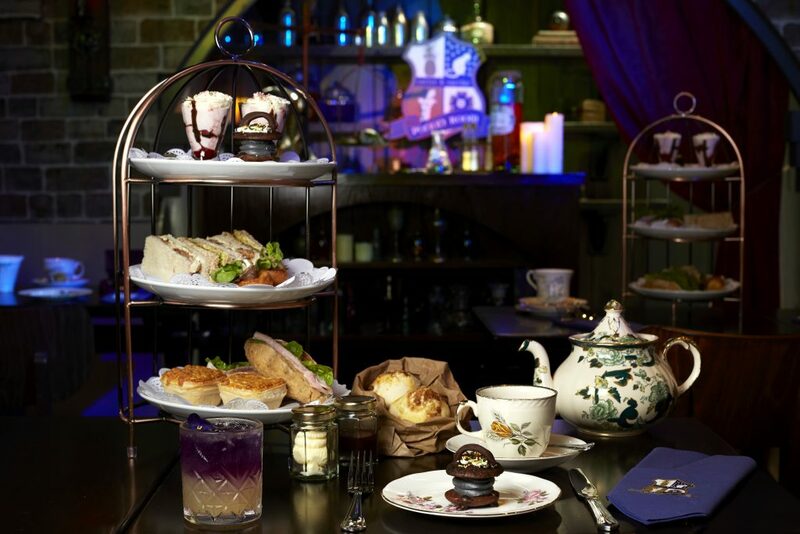 There are an additional two members of staff in the Potion Room who take the orders and serve the afternoon tea, and they know the menu well so you can ask questions. While our teas were being prepared, we created ‘Galaxy Juice’ from the liquids in chemistry beakers on our table. It made a lovely coloured-layer fruit drink. As we all did so well we were all rewarded with a bag of ‘dibbles’ (small coins) which would be needed later. And the magic continued as we were each issued with a school wand, all handmade and all slightly different. We needed this for the ‘Hubble Bubble’ we mixed in the cauldron. No photos were permitted at this point but I can say we added a dusting of ‘essence of butterfly wings’ and a coloured liquid in a test tube. We all watched in wonder as the cauldron contents fizzed and popped and turned into a delicious lemon meringue cheesecake! 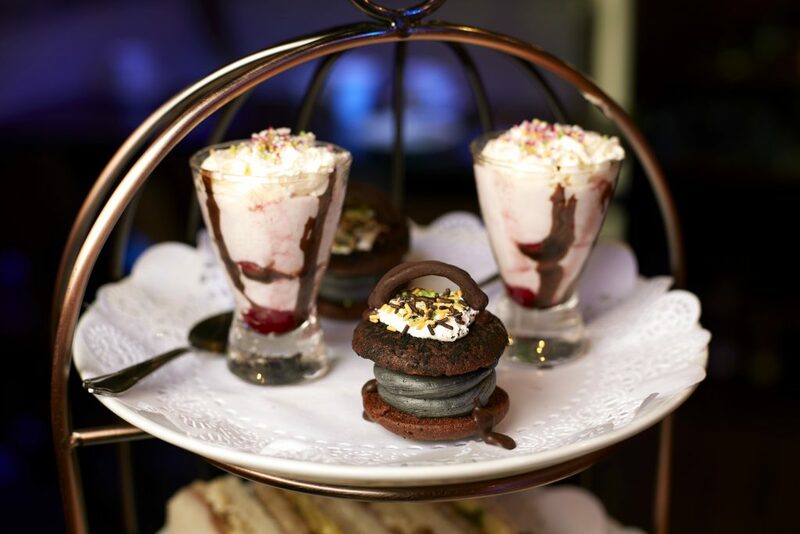 After our teas were served, the best school meal ever appeared on a three-tiered cake stand. 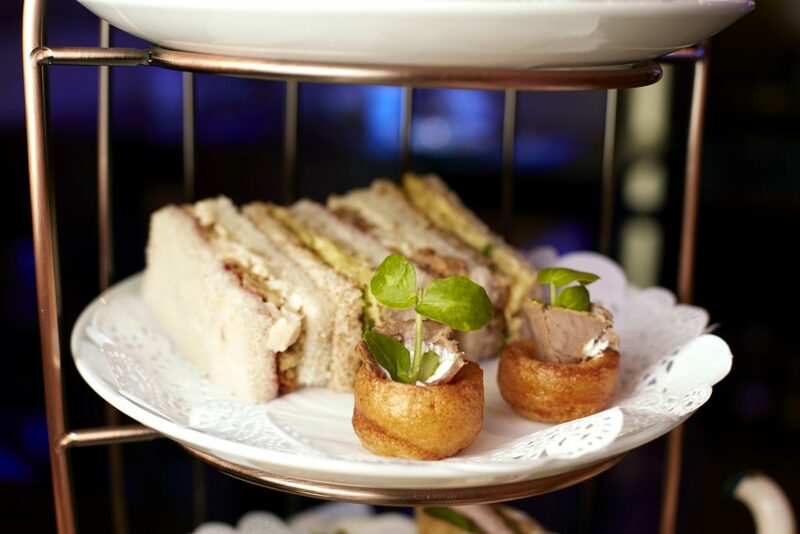 It was actually the same cake stand used for the St Ermin’s Summer Afternoon Tea I tried recently: a lovely open ‘cage’ style affair. The teacher then leaves you to get on with eating and the only sounds in the room are the other guests chatting. Some background music may help here such as the opera that was playing when we arrived. 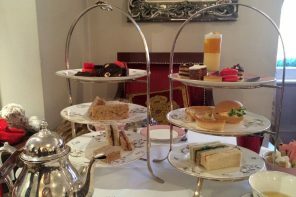 This is a traditional afternoon tea in some respects as there’s the sandwiches first course, then the ‘scones’ and then the sweet treats. 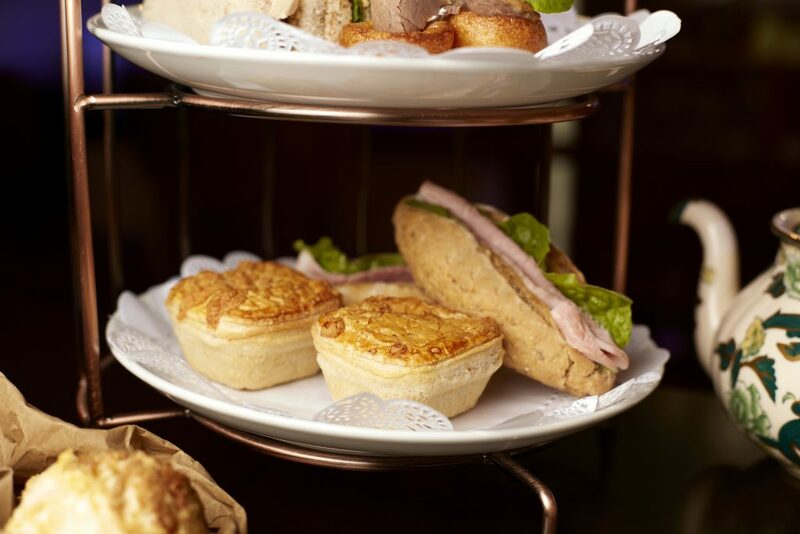 The sandwiches include a cheese ploughman’s and a roast dinner filling. The roast vegetable roll had so many veggies that it was easier to dissect to eat but the roast dinner sandwich was fun and yummy. My daughter loved the roast chicken dinner sandwich the best too. The honey roast ham roll had a dressing on it so she wouldn’t eat it. Kids, eh? The savouries also include a miniature Yorkshire Pudding with a roll of roast beef or a large slice of roasted mushroom. And there’s also a small creamy leek and potato pie which was really nice if unusual at afternoon tea. A change of plate may have been helpful at this stage but we could use the plates from the cake stand too. I simply used my saucer for the sweet treats. The scones afternoon tea course has been replaced by rock cakes. These arrive warm in a paper bag with a note to eat them before they turn into real rocks! There’s also clotted cream and homemade jam. I loved the rock cakes and the clotted cream worked really well but the jam was intensely sweet and a bit too runny for the job on warm cakes so left you with sticky fingers. Still, that’s hardly something to complain about. The top layer of the cake stand has a Cutter & Squidge trademark Biskie, this time with a butterscotch filling. And there’s a ‘Knickerbocker Bite’ for everyone too. 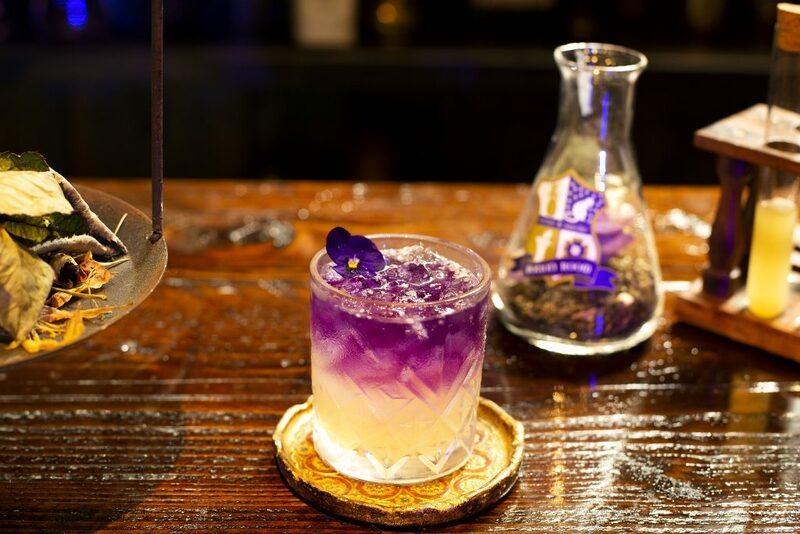 You can stick with your tea and Galaxy Juice or you can add an alcoholic potion. I tried a Unicorn Sours (sparkling lemon and vodka) but the Rumbutter Float (dark rum and butterscotch) looked good too. Remember, those ‘dibbles’ from earlier? Well, they are needed to ‘purchase’ treats that you get to take home. I won’t say anymore but will add that the sugar rush gets to continue into the next day. As before, Cutter & Squidge have created something quite magical. 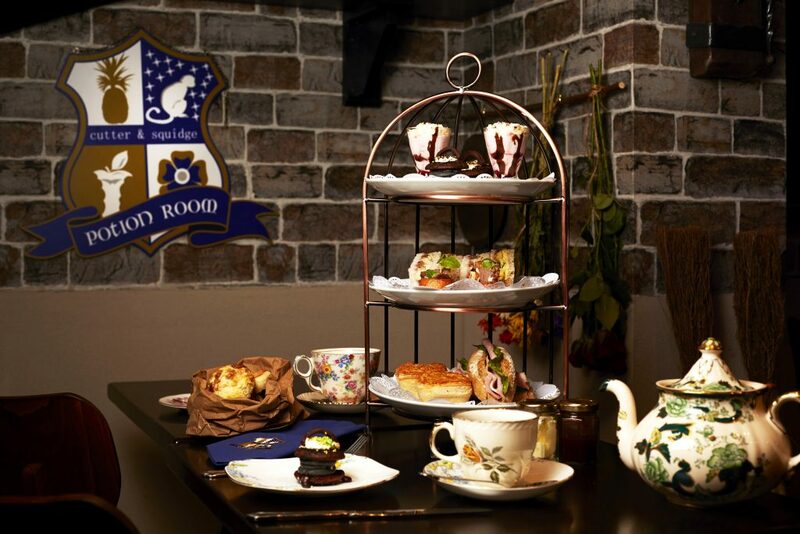 The Potion Room afternoon tea will be enjoyed by afternoon tea enthusiasts, foodies and wizarding fans. 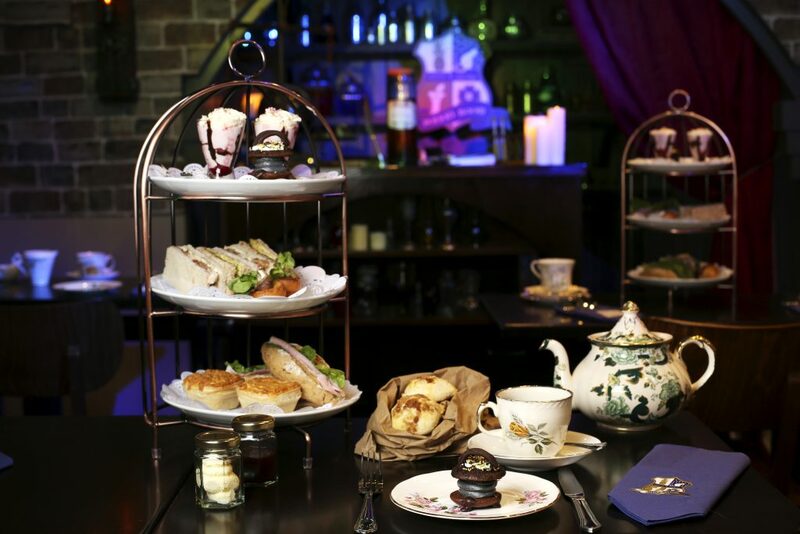 The Potion Room afternoon tea is available from 3 May 2018. It’s another limited edition themed afternoon tea but I won’t note an end date as there’s every chance this will get extended due to high demand. 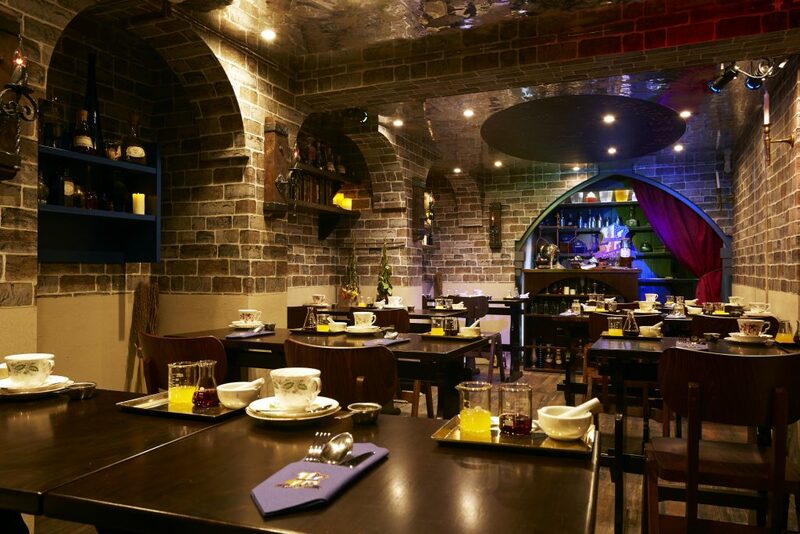 Just to be clear, The Potion Room is an experience inspired by the magical world of wizards and alchemy and is not based on any specific story or character. All content within the experience is fictional and created by Cutter & Squidge and not endorsed or affiliated in any way to Harry Potter or J.K Rowling’s Wizarding World.